The systems that carry water into a building, and then out again, are largely hidden from view giving them an air of mystery. It's not magic that makes water come out of the tap when you turn the faucet, but to get answers that help you understand how it happens, you have to ask technical plumbing questions about the basics of the system. What are the main components of a building's water supply system? Revealing plumbing's mysteries lies in asking the right questions. Pipes act as the arteries carrying water to each place you use it. Most main supply pipes are hidden in the walls, ceilings and floors. Secondary, flexible pipes that carry water from the main supply lines to faucets, and other valves like those in toilets, are exposed. You use the water at fixtures. Fixtures are sinks, toilets, tubs and showers, and any appliance connected to the system like refrigerators. You can also consider the hot water heater as a fixture. Valves control the flow of water. Faucets are valves and each fixture (except tubs and showers) also has a shutoff valve. Each system has a main shutoff valve. These valves are always at the street where the water meter is, and many times there is one near the hot water heater. What are the main components of a building's drain, waste and vent system? All the water that comes into the building that is not directly consumed must also leave the building. It does this through the drain and waste system. Again, pipes are the main arteries but these pipes are much larger than the water supply pipes. Each fixture drains into a pipe that goes on to drain into a larger pipe. Eventually all the pipes tie into one main drain line that carries all the waste out of the building to a septic system, or to the municipal sewer line. A vent system is attached to the drain pipes. This system provides air so the fixtures will drain properly. It also carries sewer gasses out of the building, exhausting them above the roof. The drain, waste and vent system includes clean outs that provide places where drains can be cleared of blockages. How are plumbing system components connected? Fittings and valves connect all the pieces of the building plumbing system. Common fittings are elbows, tees, adapters and connectors. Use copper fittings with copper pipe and PVC fittings with PVC pipe. 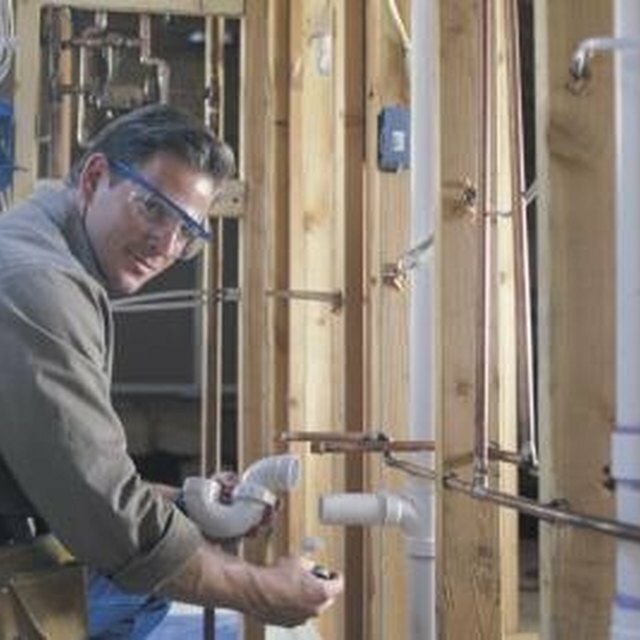 Use brass, PEX fittings with PEX. Connect pipes and fittings using the process that matches the type of pipe. Copper is soldered while PVC is welded with solvent. Connect PEX pipes using clamps. Fixtures, except tubs and showers, connect to shutoff valves, and to drain pipes with threaded fittings. Tubs and showers connect directly to the supply pipes with threaded fittings.